The traditional pattern of pre-season dictates the focus remains on fitness and friendlies - the former to prepare for the long-term challenges and the latter for short-term progress. The hard yards put in across the close-season period will provide energy in the tank across the season, with the summer fixtures offering a chance to blend together a squad and implement a tactical blueprint. An alternative pre-season approach adopted by Loughgall has been forced on the management team of Stephen Uprichard and Steven Hawe due to the rebuilding programme in place. However, it is hoped that the summer months spent spreading the net of potential signings as far as possible can produce a rewarding end product. “The reality is we cannot compete financially with so many of the clubs at this level so need to think in a different way about signings,” said Hawe. “We have signed a few players, people like Wilson Favares, Nicky Hudson, Josh Finlay, John Uprichard and Mark Dane. “We are still aiming to add in a few more and Graeme Taylor is expected home soon from America, although Josh has now gone off around Europe. “We enjoy the coaching side of the game and this is a great club to play for but we still have to approach signings in a different way due to the circumstances. “It is about using our contacts and if someone like Stephen Uprichard gets a phone call suggesting a player, then we will always take a look. “As someone who was still playing relatively recently, I know other former players now in management so you try to use those contacts as well. “We have had quite a few changes over the past year or so and especially this summer. “We need to take a look at as many as possible then go at the signings in a different way. 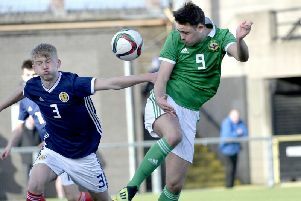 “It is about trying to maybe offer a loan option for the senior clubs or giving someone a chance after that player has missed out with another Irish League side. “We have even looked down at the Mid-Ulster level to give players an opportunity. “Then, of course, other players will wait until the end of August to make a decision if they feel a move can provide regular football. Hawe highlights the positive finish to last season as cause for cheer. “The players really responded well to our methods last season,” said Hawe. “We have always maintained there is quality at the club. “It is about having the spine in place going from Gareth Buchanan, Ricky Copeland, Steven Ferguson, Marcus Dallas and Warner Mullen then building around it. “Wesley Boyle brings so much creativity to the side and is now also on board as part of the coaching team, so his experience from across the water at Leeds United then back home in the senior Irish League can add a lot. APRIL: 02 - H&W Welders (h): 16 - Institute (a): 23 - Annagh United (h); 30 - Ards (a).